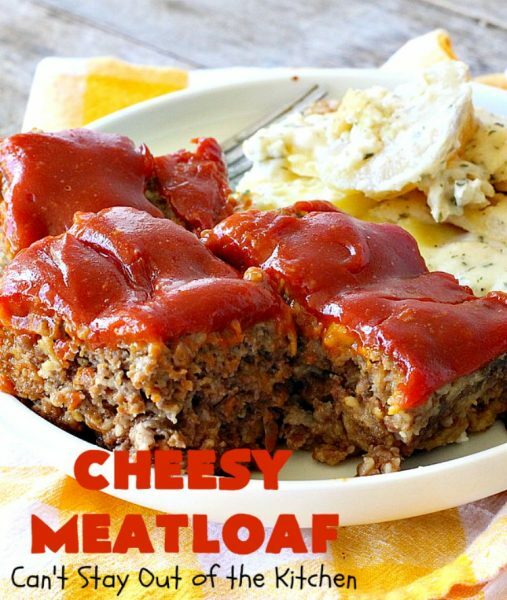 Cheesy Meatloaf is one delicious meatloaf! 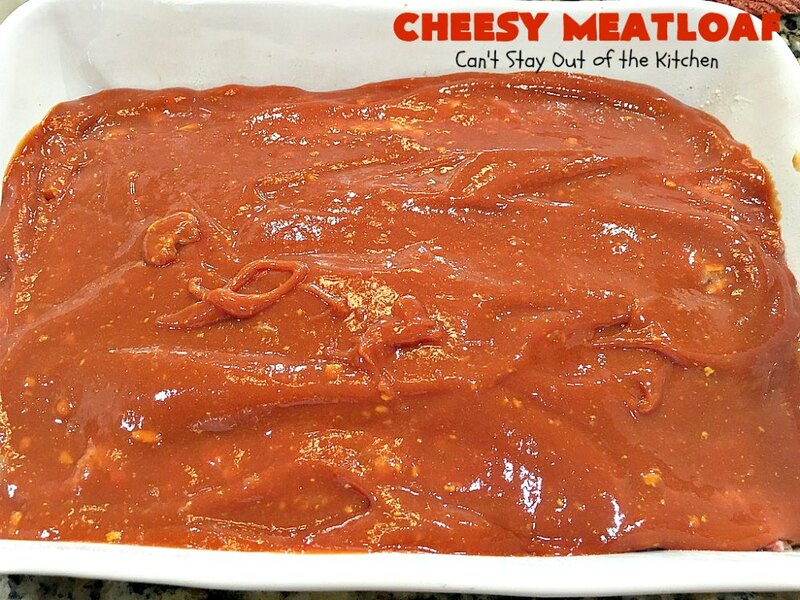 I use the leanest ground beef – 96% lean for this recipe so it doesn’t have a lot of grease. 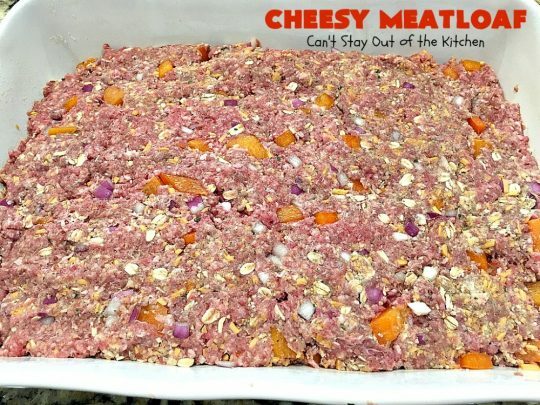 This easy Cheesy Meatloaf uses diced red bell pepper, red onion, oats, gluten free bread crumbs, milk, an egg, cheddar cheese, and Worcestershire sauce. Then it’s topped with a sauce made of ketchup, brown sugar and mustard. It bakes up to perfection and tastes heavenly. 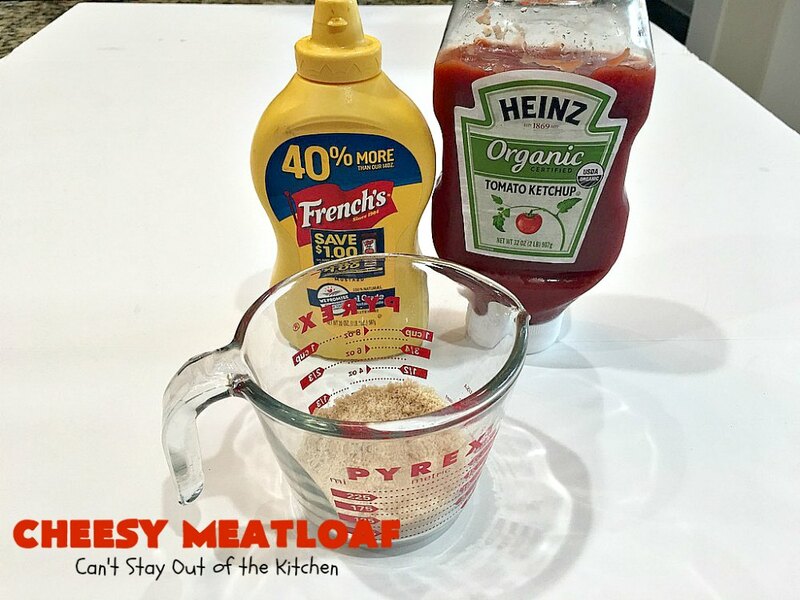 This gluten free recipe is actually a little healthier than many meatloaf recipes because I use Hunt’s ketchup without preservatives and high fructose corn syrup. Also because this recipe calls for oats instead of regular bread crumbs, you eliminate the high fructose corn syrup, MSG and other fillers usually found in processed bread crumbs. Instead, I used gluten free bread crumbs which don’t seem to have near as much fillers as regular bread crumbs. This recipe does call for brown sugar in the topping, but if you needed to swap that out for honey, you could probably do so. Still the Worcestershire sauce and ketchup have some sugar so it’s hard to escape it entirely unless you make your own from scratch. When we attended Hillcrest Baptist Church in Cedar Hill, Texas, for about thirteen years, we had some good friends that went with us on mission trips to Wyoming several years in a row. Cathy and I both love to cook (as well as eat! ), and our husband’s have always enjoyed our cooking (maybe a little too much 🙂 ). Be that as it may, Cathy and I swapped a lot of great recipes and she was a big supporter of my blog in the early days of getting it off the ground. I asked for Cathy to give me some of her favorite recipes so that I could try them and eventually feature them on the blog. This was one of those recipes. I really didn’t need another meatloaf recipe, but I decided to give this one a try a few weeks ago. It wasn’t until I really looked the ingredients over that I realized that it was gluten free and a little healthier than most meatloaf recipes. Not that it’s any lower in calories–not with cheese or the sweet and sour sauce over the top! But this is one scrumptious recipe. I wish I would have tried it a lot sooner. It’s so easy that I will probably make it frequently. 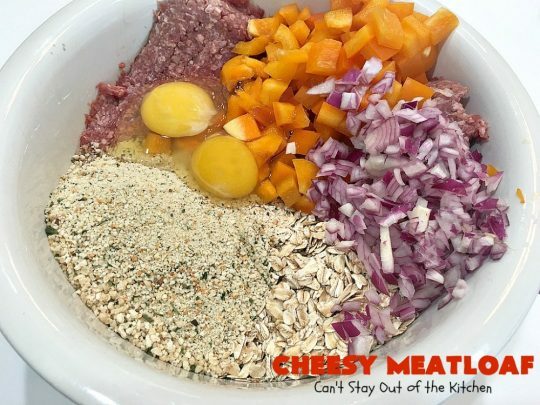 If you’re on the look out for a tasty and delicious meat loaf recipe, and none of your meatloaf recipes seem to work out, then give Cathy’s Cheesy Meatloaf recipe a try. Cathy initially recommended not packing the mixture very tightly before placing it in the dish to bake. I have changed this up. I pack the meat more tightly making it easier to serve later. The taste and texture of this meatloaf is really is amazing. We loved the sweet and tangy sauce on top. And the nice thing about meatloaf is you can dress it up with some really nice sides like Garlic Mashed Potatoes, Shoepeg Corn, or anything else you want to eat. 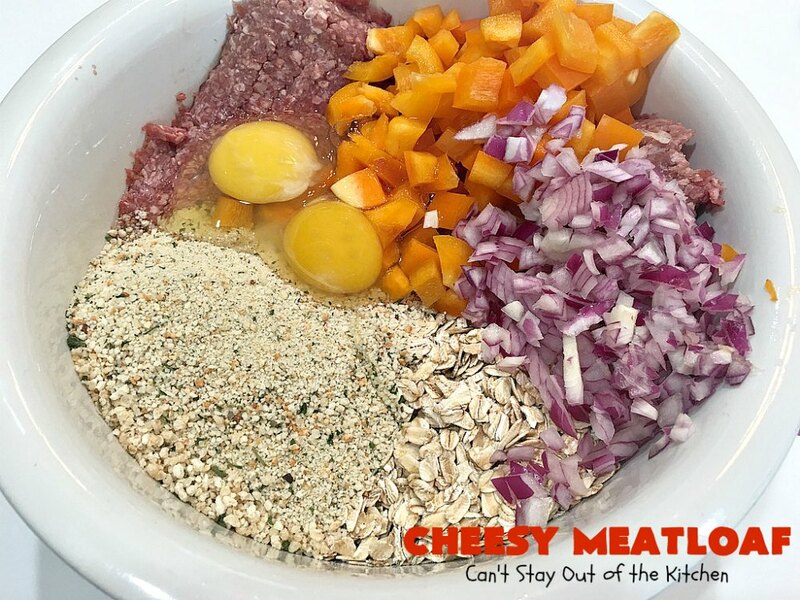 We loved Cathy’s Cheesy Meatloaf and hope you will too. 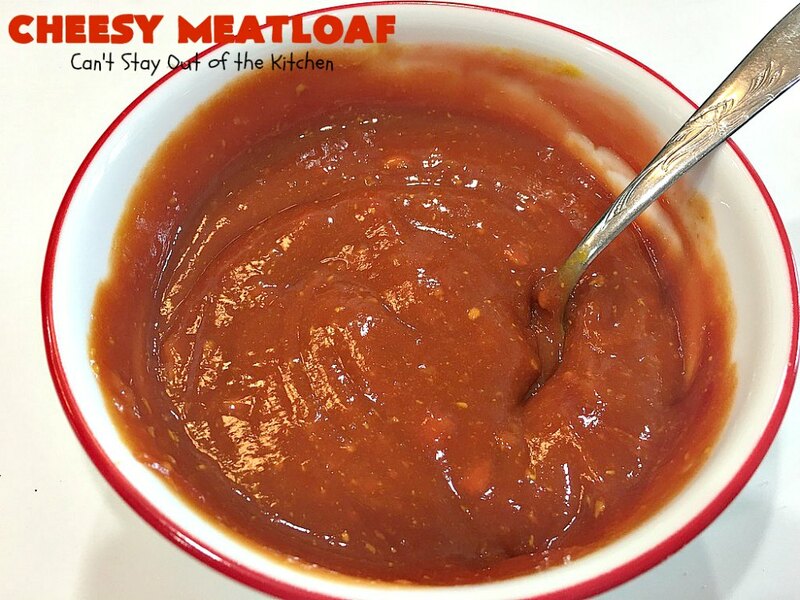 When I initially posted this recipe in May 2014, I followed Cathy’s directions to not pack the meatloaf very tightly. Unfortunately, the meatloaf seemed to fall apart when slicing which made it quite unpresentable. 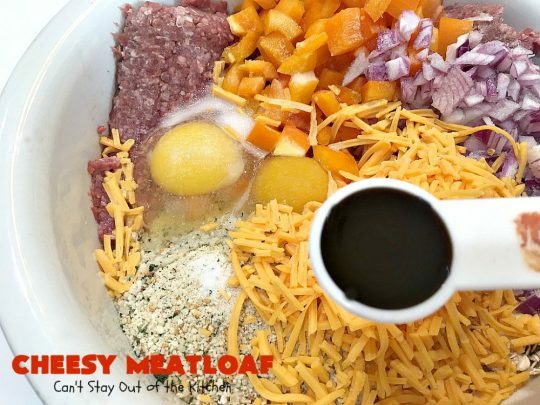 This time when I remade this recipe (September 2018), I packed the meatloaf very tightly like I would normally. I also added gluten free bread crumbs (which weren’t in the original version. I wanted to make sure the recipe was solid enough that you could cut it without crumbling. I used shedded cheddar cheese this time, because that’s what I had on hand. But I think cheese cubes work out more nicely. I served it with my favorite Seasoned Scalloped Potatoes. A win-win for all of us. 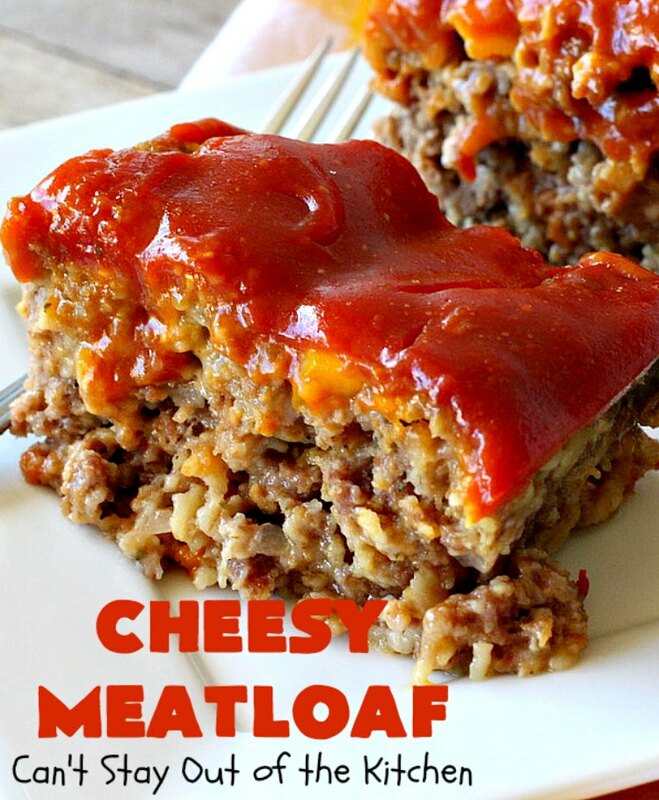 Cheesy Meatloaf is a delicious meatloaf recipe you’re sure to love. Not only is this meatloaf filled with cheese cubes, but it has a wonderful tangy, sweet and sour sauce on top. 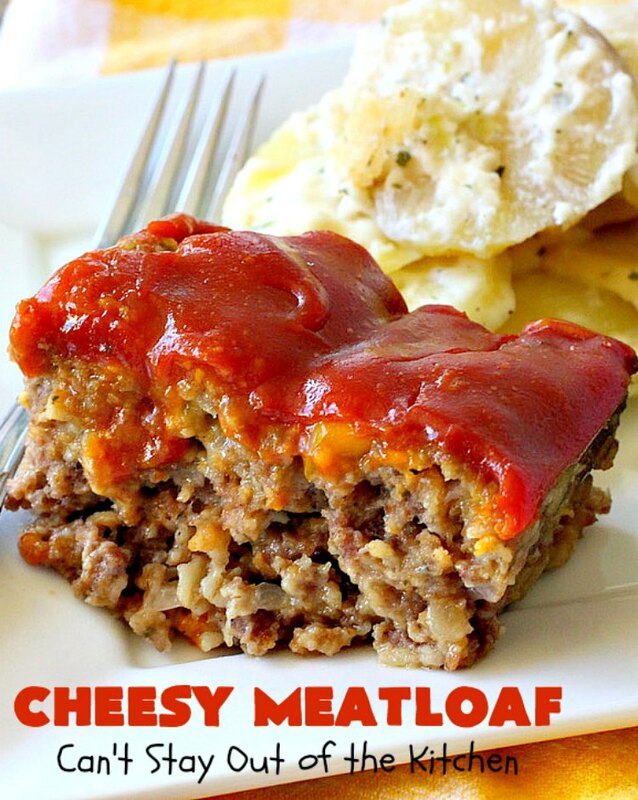 Cheesy Meatloaf is gluten free and a little healthier than many meatloaf recipes. I served it with Garlic Mashed Potatoes and Corn the first time. This time I served it with Seasoned Scalloped Potatoes. 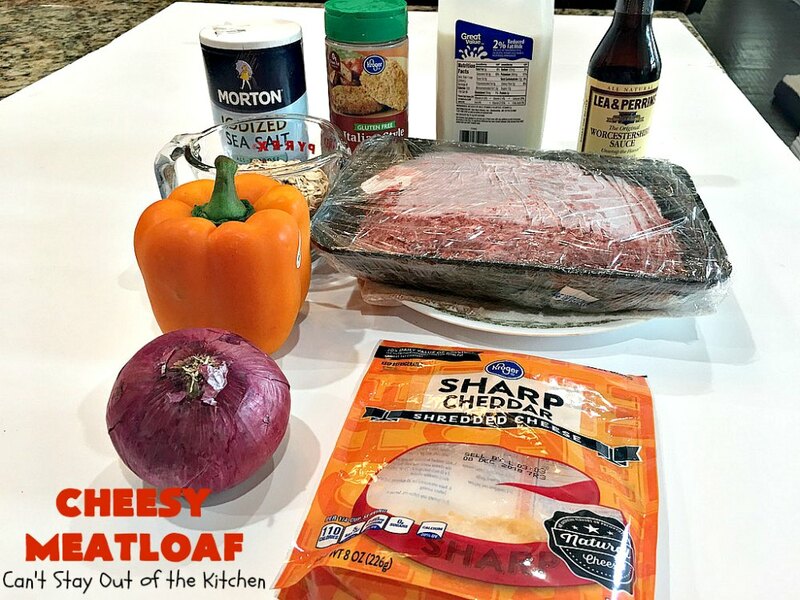 These are the ingredients I used for Cheesy Meatloaf. While I used shredded cheddar cheese this time, it’s so much better with cheese cubes. I made a double batch of this recipe so ingredients shown are twice as much as normal. 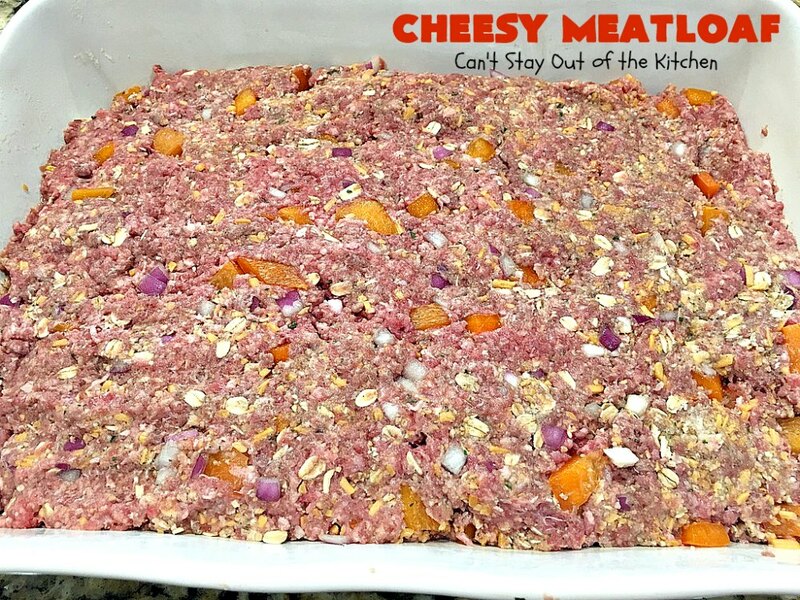 Place meat, oats, gluten free bread crumbs, eggs, orange bell pepper, diced red onion and salt. Add milk and cheddar cheese. (Cube the cheese if you have a block of cheese). Spray a 9×13″glass baking dish with cooking spray. 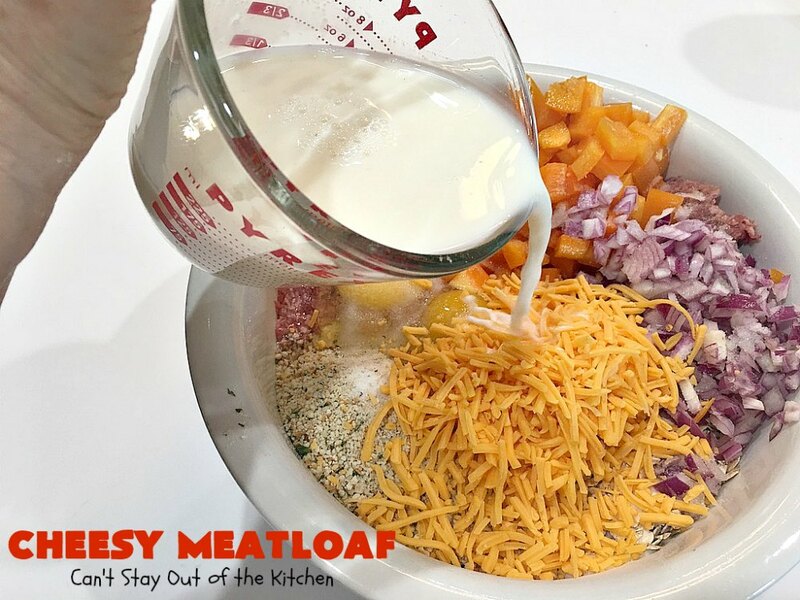 Shape meat into a loaf or press to fill the whole dish. I used these ingredients for the topping. Pour sauce over top of meatloaf. Bake uncovered at 350 for about an hour. Each bite of Cheesy Meatloaf was so wonderful. Cheesy Meatloaf is not too difficult to make either. This is not one of those meatloaf recipes that is packed together tightly. I served it with Seasoned Scalloped Potatoes. Cheesy Meatloaf and Seasoned Scalloped Potatoes make a fantastic meal. 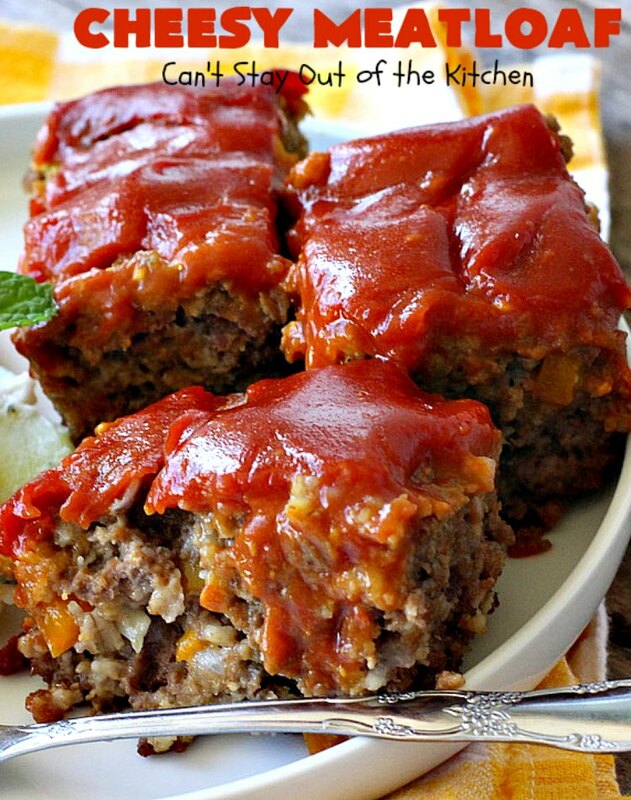 Wonderful meatloaf recipe loaded with veggies and cheese. This one has a tangy sweet and sour sauce and is gluten free. 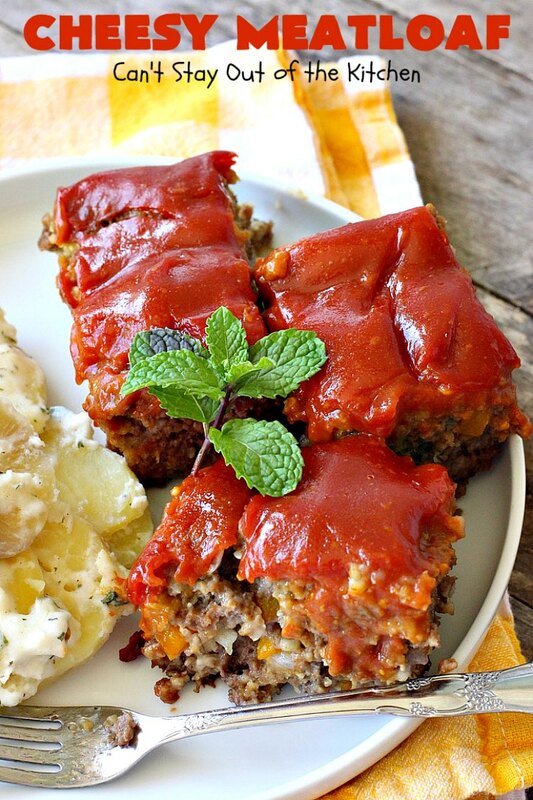 This kid-friendly meatloaf is terrific for weeknight dinners. Grease a 9x13" glass baking dish. 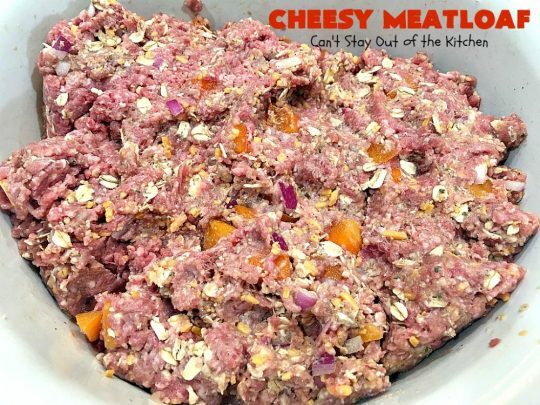 Mix ground beef, oats, gluten free bread crumbs, onion, bell pepper, salt, egg, cheese, Worcestershire sauce and milk with your hands. Shape into a loaf and place in baking dish. Pour over top of meat loaf. Bake 350° for 1 hour, uncovered. NOTE: Cathy's instructions were to shape the meatloaf loosely. For ease of cutting and serving, I think it is better to press the ingredients firmly together while shaping the loaf. You may have to adjust the cooking time by adding up to fifteen additional minutes to ensure the meat cooks thoroughly in the middle. NOTE: This recipe works better with cheese cubes rather than shredded cheddar cheese. But I didn't have any block cheese when making this. 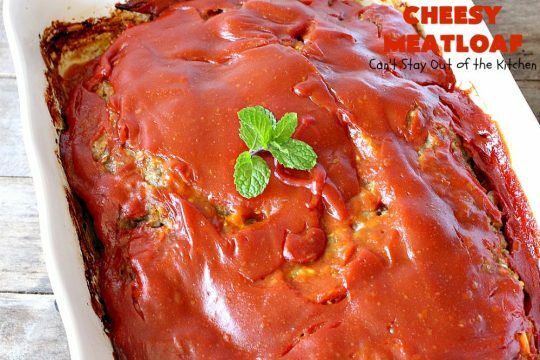 Wonderful meatloaf recipe loaded with veggies and cheese. This one has a tangy sweet and sour sauce and is gluten free. Grease a 9×13″ glass baking dish. 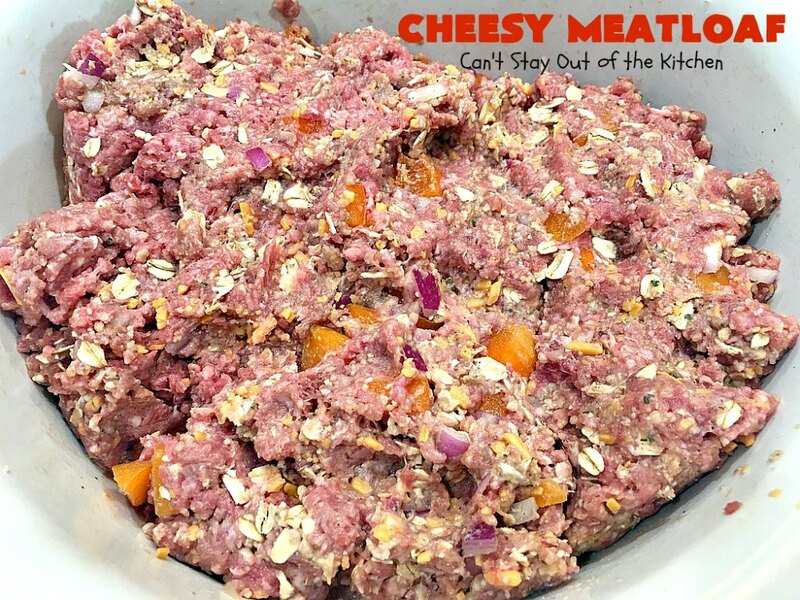 Mix ground beef, oats, onion, bell pepper, salt, egg, cheese, Worcestershire sauce and milk with your hands. Shape into a loaf loosely and place in baking dish. Don’t pat the ingredients together too tightly. Doesn’t Cheesy Meatloaf look mouthwatering? 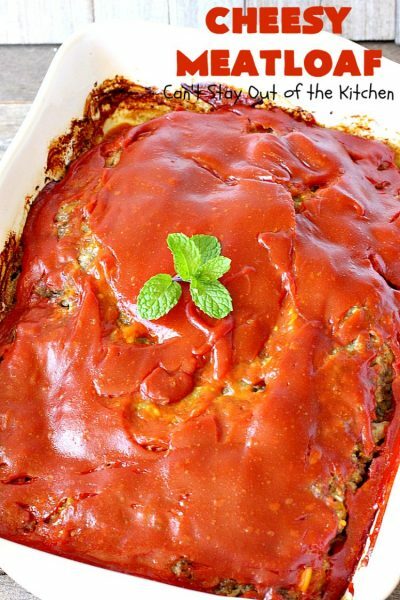 We loved the taste of this terrific meatloaf recipe. When I made this the first time, I served it with Garlic Mashed Potatoes. The next time you’re looking for a kid-friendly meatloaf recipe, give Cheesy Meatloaf a try. 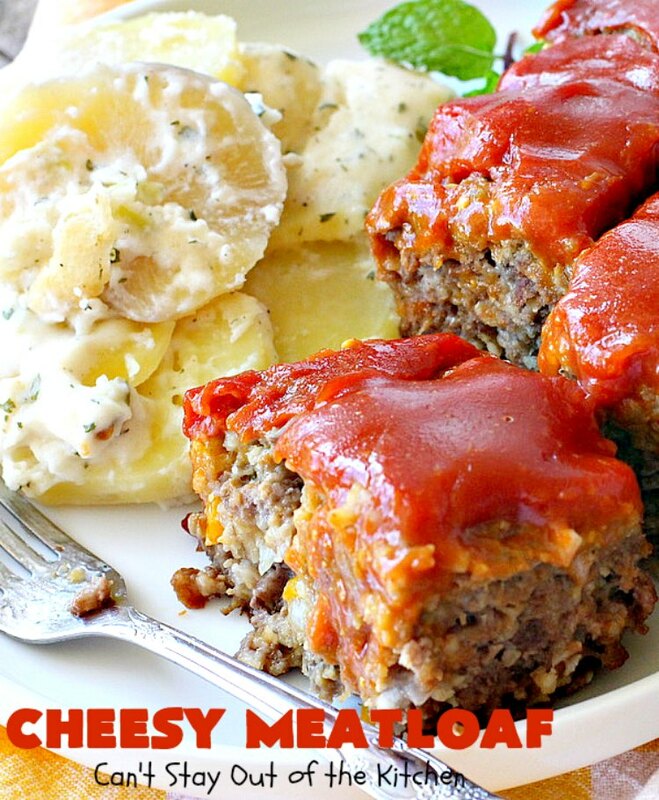 This Cheesy Meatloaf is gooey and delicious. Do you have any left? I’ll be right over! :) This looks so good. 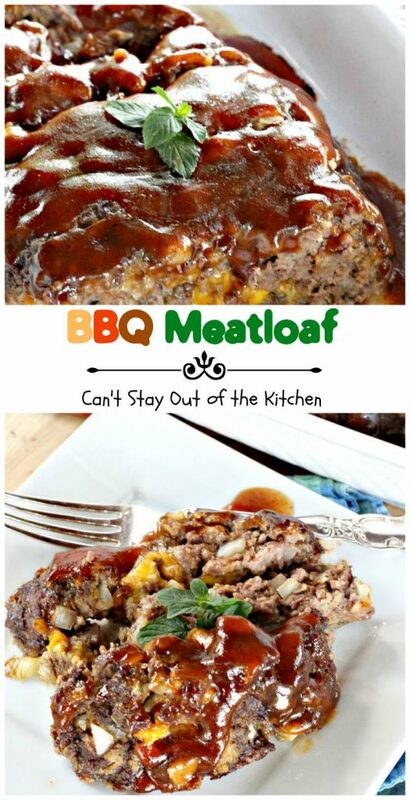 I really don’t have a good meatloaf recipe, and I love meatloaf. Between the cheese and the brown sugar, I am going to have to try this one! This one is super. I also have two others posted that are excellent. One is Paula Deen’s Bacon Cheeseburger Meatloaf – excellent, and Rodger’s BBQ Meat Loaf – the first recipe I ever collected when I was about 18 or 19! 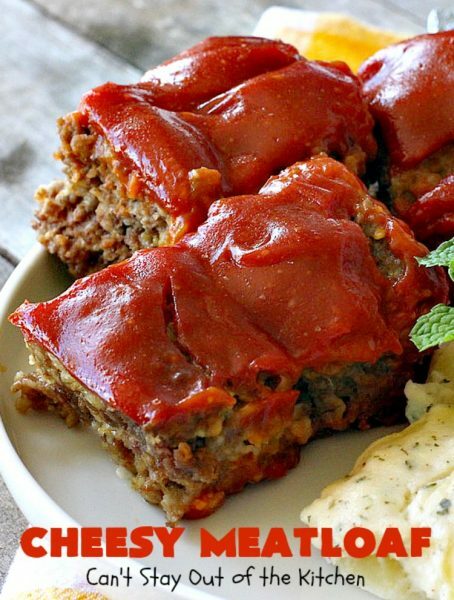 A wonderful bbq meatloaf recipe. Give them a try. You will love them!